Adamantite is the mid level ore in the Outlands. 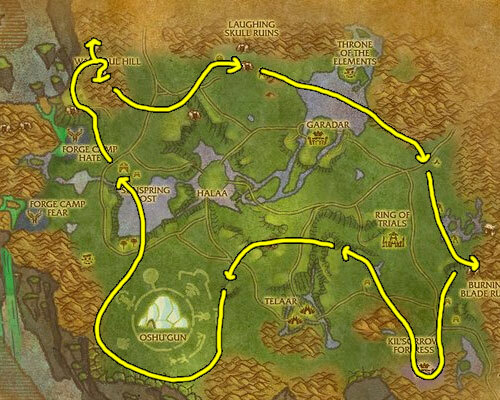 It’s found in most Outland zones except Zangarmarsh and Hellfire Peninsula. It sells very slowly but can be worth 5-10 gold each if no one else is selling it on the auction house. It’s best to sell these in stacks of 20 so that you can sell as many as possible to people who are looking for less. You will want to be level 65 or so before trying to farm it and have level 325 mining. It sells to players who are leveling Blacksmithing or Engineering. Update: You can make a lot of gold with Adamantite, but if you want to step it up and make thousands of gold you should read my personal favorite guide. The best place to farm Adamantite Ore is in Nagrand. 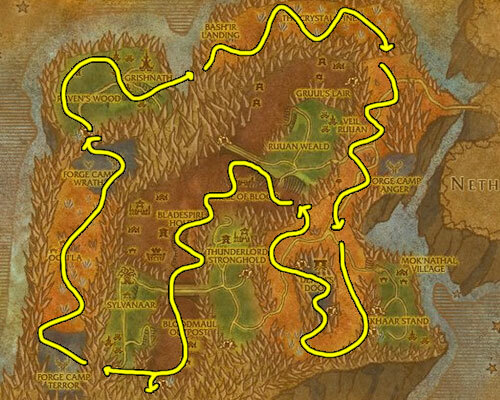 The best part about this zone compared to the other options is that its small so the veins are a little closer together. There are also a few caves at Warmaul Hill that you can go into and find some veins. Follow the below mining map to find as much Adamantite as possible.